Serves: 6, as part of a meal. Wash the mussels, pulling off the beards and scraping off barnacles. Discard any mussels that are damaged or don't close when tapped. Mix the remaining ingredients together. 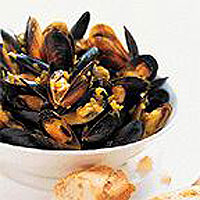 Tip the mussels on to a hot barbecue grill or griddle plate and barbecue for a few minutes until they open. Dribble a little of the paprika marinade mix into each and cook for a further 1-2 minutes until the liquid has reduced. If you're using a griddle plate, you can pull off the the top shell and turn them over for another minute to caramelise the marinade, but be careful not to overcook. Serve immediately with damper.